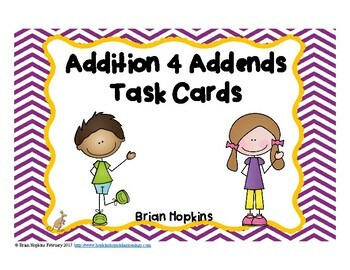 These 24, Addition with 4 Addends (numbers) Task Cards are in b/w only and are perfect for math stations, rotations, centers, or to play "Scoot", "Quiz, Quiz Trade" and another cooperative group activities. 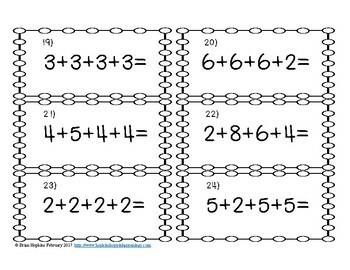 They also work well for math journals, whole group, small group, homework, etc. 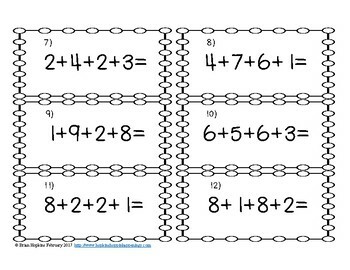 Children can use the strategies of making 10 and doubles to help them solve the problems. If you enjoy the product please consider leaving positive feedback and you will get credit for future products. 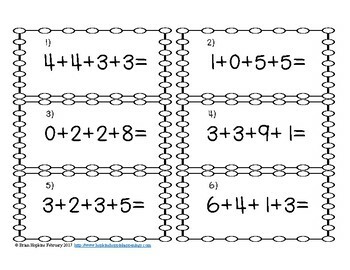 If you find an error please be kind and e-mail me at tigermagic@bellsouth.net prior to feedback and give me the chance to correct it and you can redownload for FREE.